I hope you all had a fabulous weekend. I spent mine outside enjoying yet another beautiful Fall afternoon. I mowed Sunday afternoon, that makes 24 times I've mowed this year. The grass around here just won't stop growing. Is this my last time mowing? Guess Mother Nature will determine that. 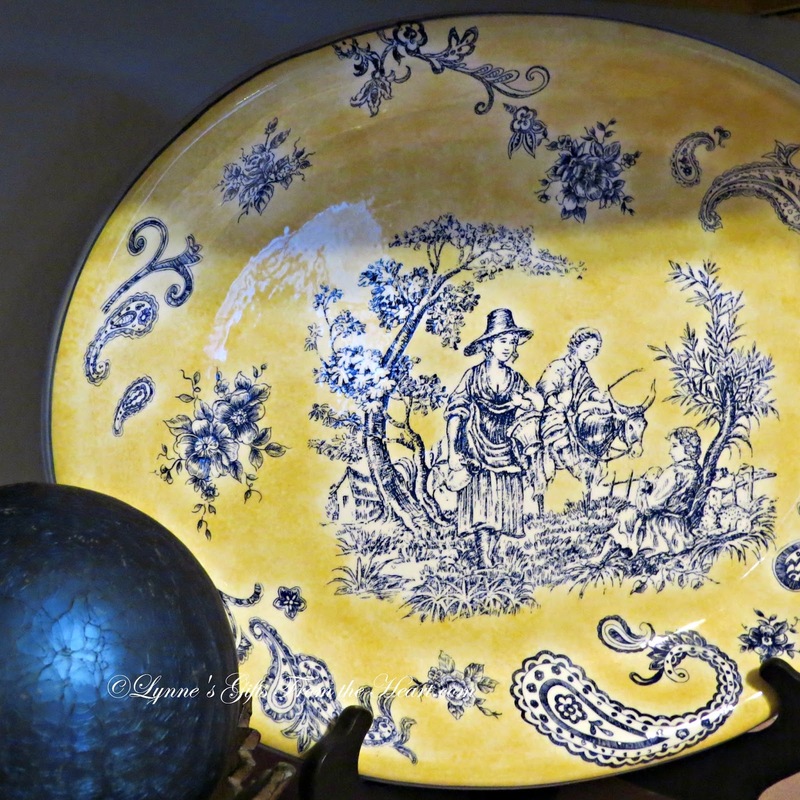 Are you one of those who gets lucky and runs across a furniture piece an accessory or platter that speaks to you? By the looks of some of the vignettes around here QUITE a few things were lucky enough to come home with me. many of those vignettes have been edited. I've discovered the journey I'm on right now doesn't require everything to be out at one time. 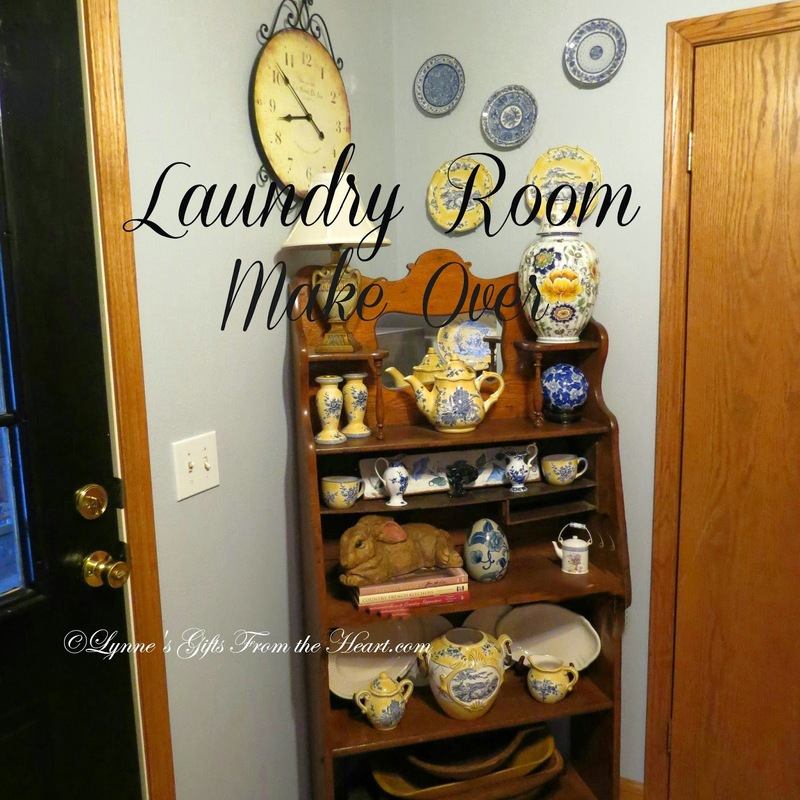 One of the areas to be edited and re-edited was the laundry room. After entering the sun porch on the back side of our home this is the first room you enter when coming inside. Like all of our rooms I like for it to be warm and inviting. This is a room with no windows except for those small panes in the outside door. I'm not quite sure what I was thinking when I painted four years ago this room was a taupe color called Furry Otter Tail. I loved the color at the time, then realized it was just too dark for this area. I got the paint out and got busy re-painting. The color now is Antique Silver, with a slight blue cast it makes the room a lot lighter and brighter. 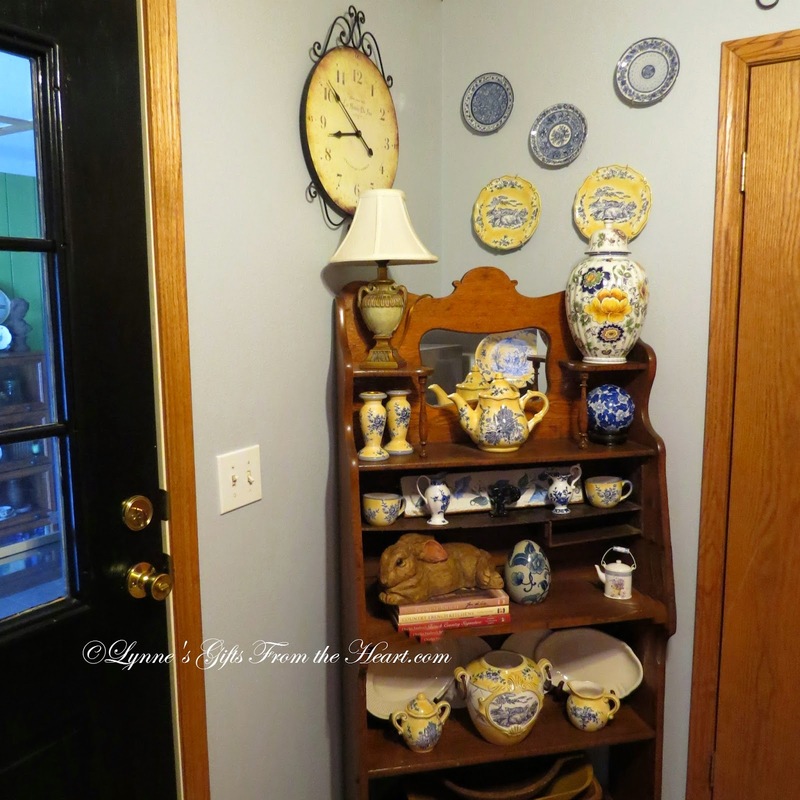 The room isn't all that small but is filled with an alcove for the washer and dryer, the door leading to the powder room, the door leading outside to the sun porch, a small closet and yet another door that has a beautifully sized pantry behind it. Yes, you have it a room full of doors, I did manage to have this small corner for a piece of furniture and a nice sized wall space for some decor. After finding the treasured platter I remembered I had a few of the same dishes at home. I got busy and pulled them from the pantry, placing and replacing them in the Larkin desk until I was satisfied with the configuration. On the second shelf you can see a beautifully painted piece of wood. A friend of mine painted this and gave it to me after I lost Mr. P. The thought and gift is priceless, thank you Karen Bush. 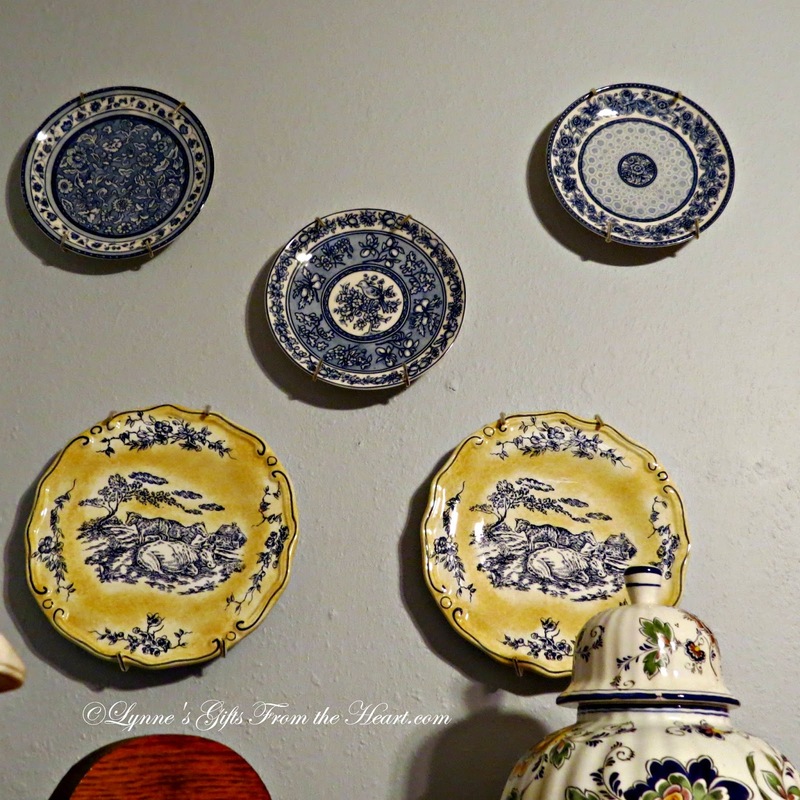 The collection of white platters have started to take over, as much as I love viewing them hanging on the wall, face it there just aren't enough walls in a home to handle it properly. So I decided to display them in the Larkin's desk. 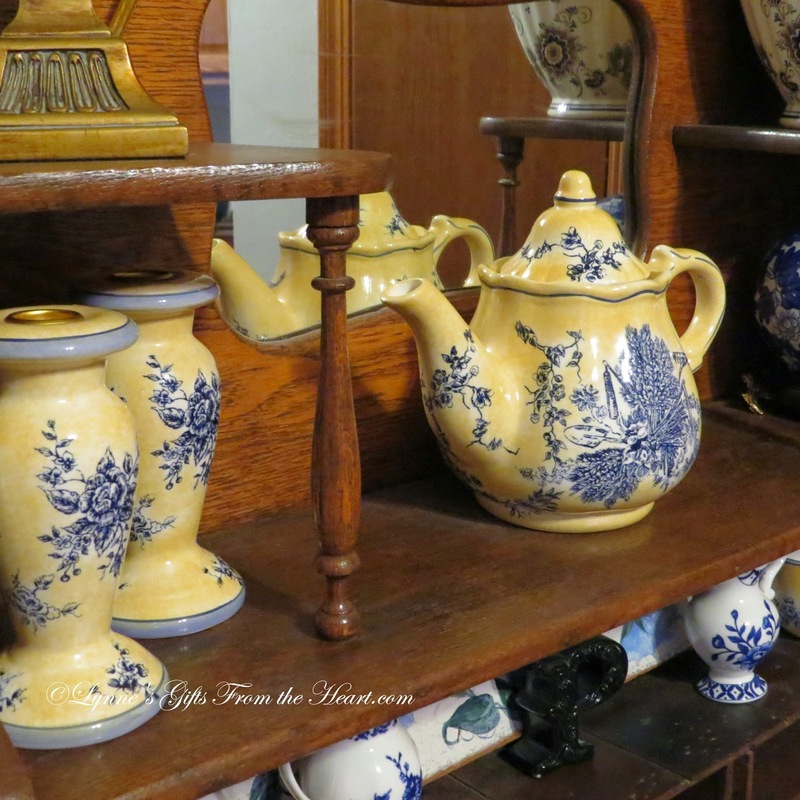 The sugar bowl, creamer pitcher and compote fit nicely in front of them. 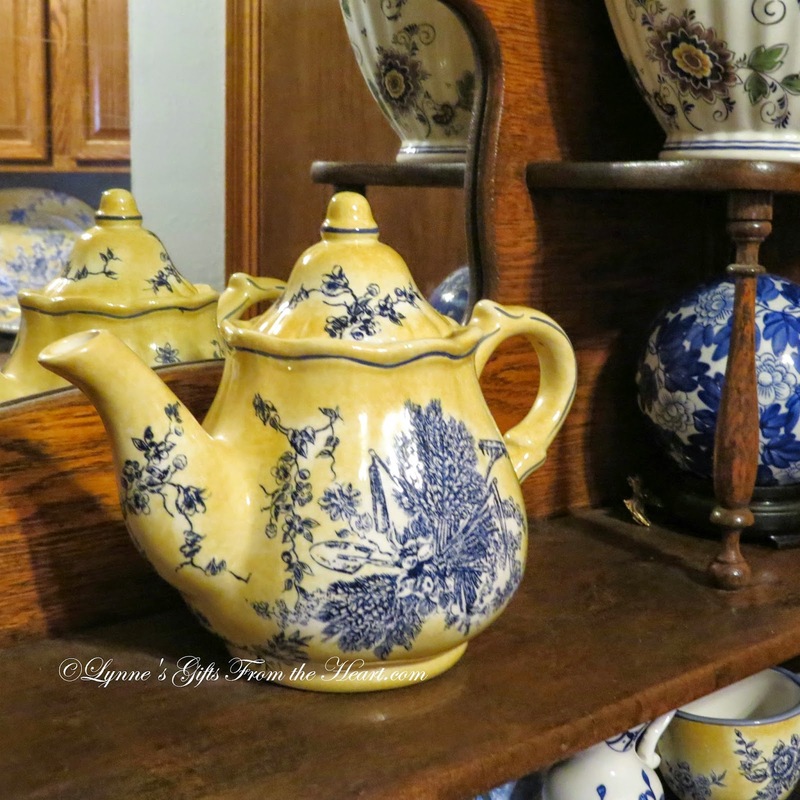 I recall the tea pitcher is the culprit that started the collection of this set of yellow and blue dishes oh so many years ago. At the time all I could find were these two salad plates. 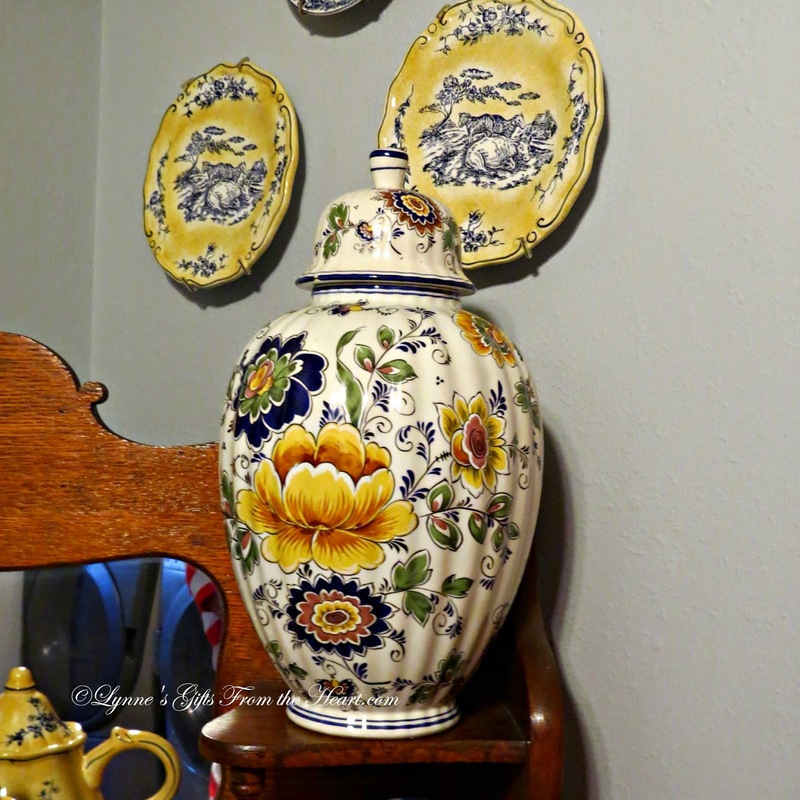 The large ginger jar was a purchase about 29 years ago at a floral shop here in town that has since closed. It's been packed a way for a very long time. 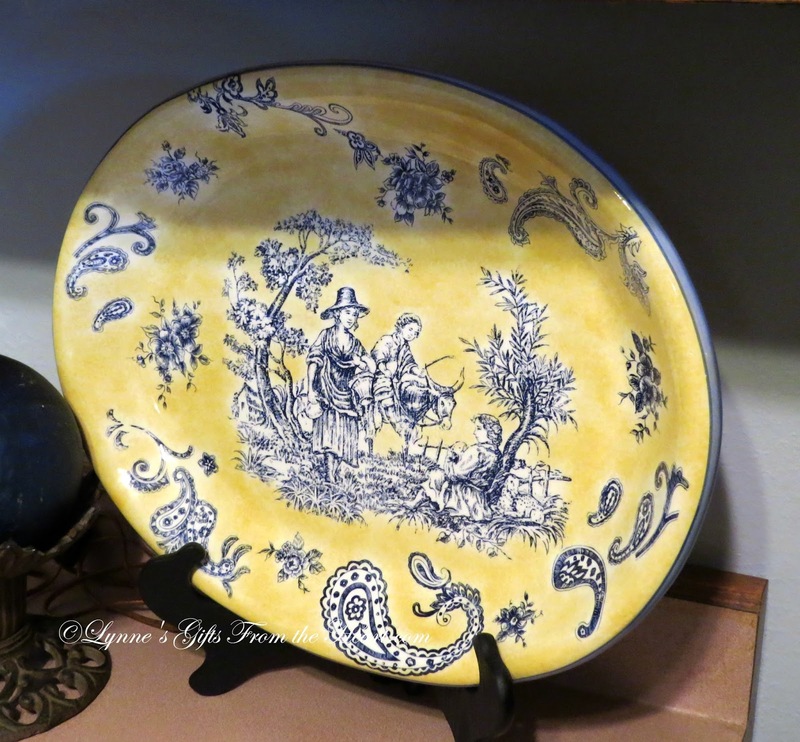 I'm happy to have it out and feel it coordinates nicely with the blue and yellow dishes. Since I only had two of the salad plates they looked a bit lost on the tall wall. 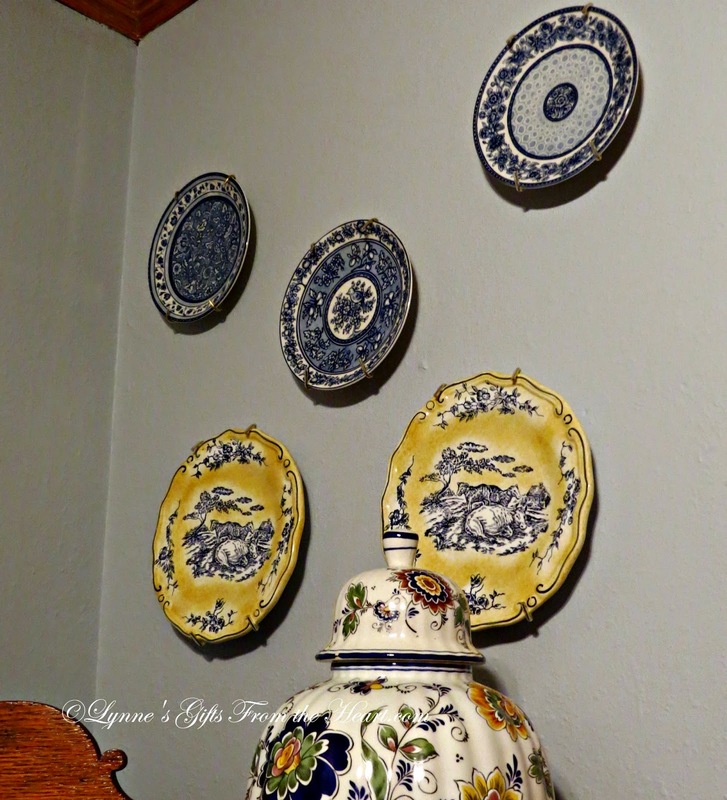 I ran across the trio of blue and white plates at T.J. Maxx awhile back, they put the finishing touch on this wall. Ta-Dah!! The platter that started it all. My original plan was to hang it on the wall over the Larkin's desk. Well folks, this is one heavy platter. I fretted over another game plan for a couple of days or so. Then a light bulb went off and I shuffled the decor off the cabinet that sits beside the washer and dryer. The blue gazing ball is actually a Christmas ornament I've had for about 16 years. It's been all over the house. That's the beauty of decorating your home in like decor, it can move around your home and feel like new in it's new landing spot. Don't be afraid to think outside the box when you see something you fall in love with, when I first spotted the ornament I knew it would take a special place around my home other than just at Christmas time. There is a small area between the three cabinets that hang over the washer and dryer. It's original use was to hang clothes when you pull them out of the washer and dryer. I never used the small pole and took it down right after we moved into our home. I've hung many thing in this small space over the years. After painting the walls were bare for a very long time. 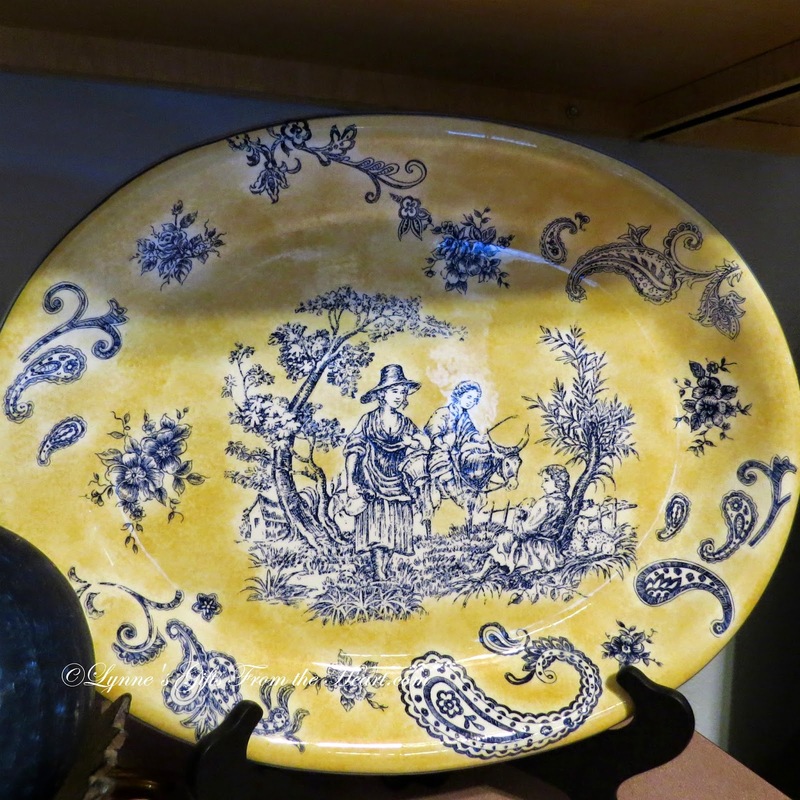 When I began pulling out the yellow and blue dishes I remembered this blue and white platter, it's a perfect fit. There is one more short wall before you head into the kitchen. 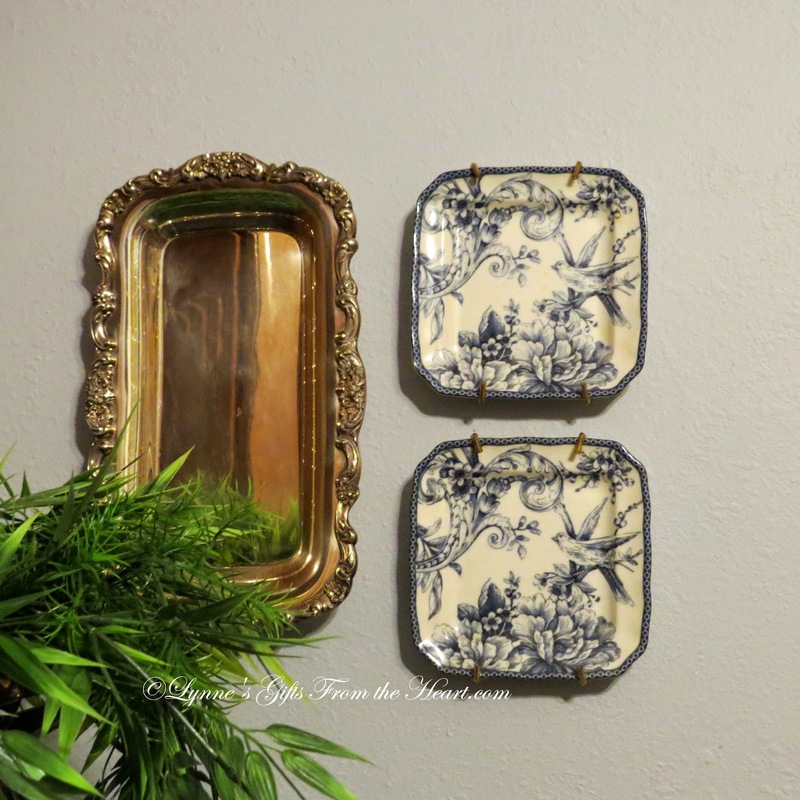 I chose to add these small plates with a silver serving dish. Wow!! I'm amazed how about you? I cannot believe it was so dark before, you can see the before HERE Funny how you live with things and don't realize how locked in what you see on a daily basis. I love the room so much better now, what do you think? Thanks for stopping by and viewing one of the many changes I've been working on around here. look forward to reading what you thing of the before and after. 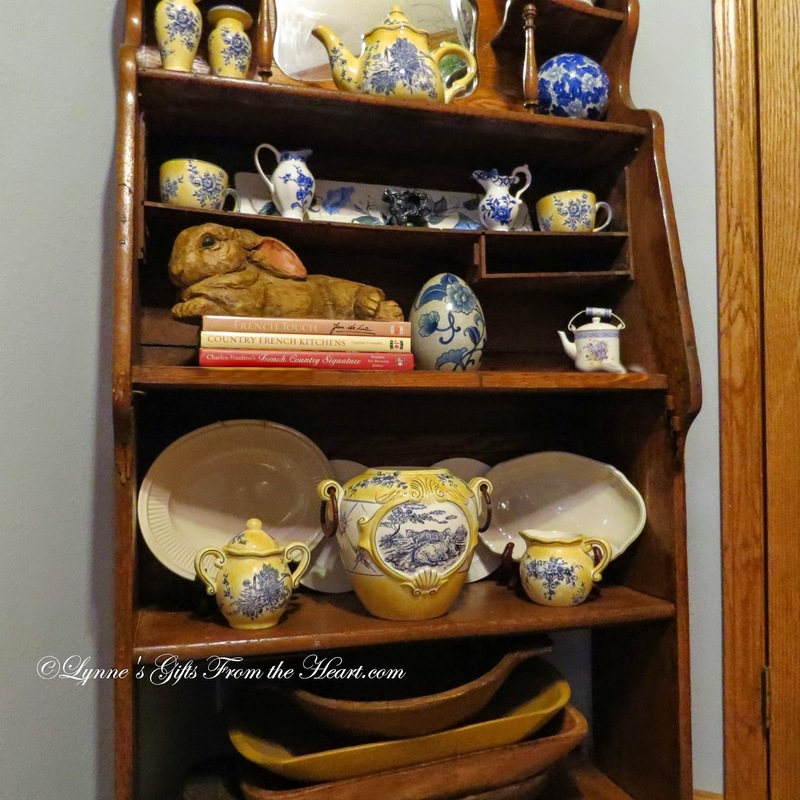 Oh Lynne, I love the beautiful yellow and blue dishes. They look so good and you placed them well. So glad that you are back posting again. Take care of yourself. Your dishes are so pretty. Don't blame you one bit for collecting them and love the way you have arranged your display. What a lovely make-over! So bright and cheerful now. The yellow dishes are beautiful --- my fave color. I love seeing the changes you make in your home. You're very talented. HUGE change, Lynne! It looks great! I'm really kind of glad that you didn't gamble with hanging that heavy platter. That seemed to me to just be askin' for it!!! Better to have it safely and securely planted on terra firma! I'm with you on becoming comfortable with not having EVERYTHING out on display. Rotation keeps things fresh, light, and gives us something to do that's fun and creative! Of course, dear friend, I love this little room, too!!! The yellow, blue and white is cheerfully displayed within your desk and wall space. 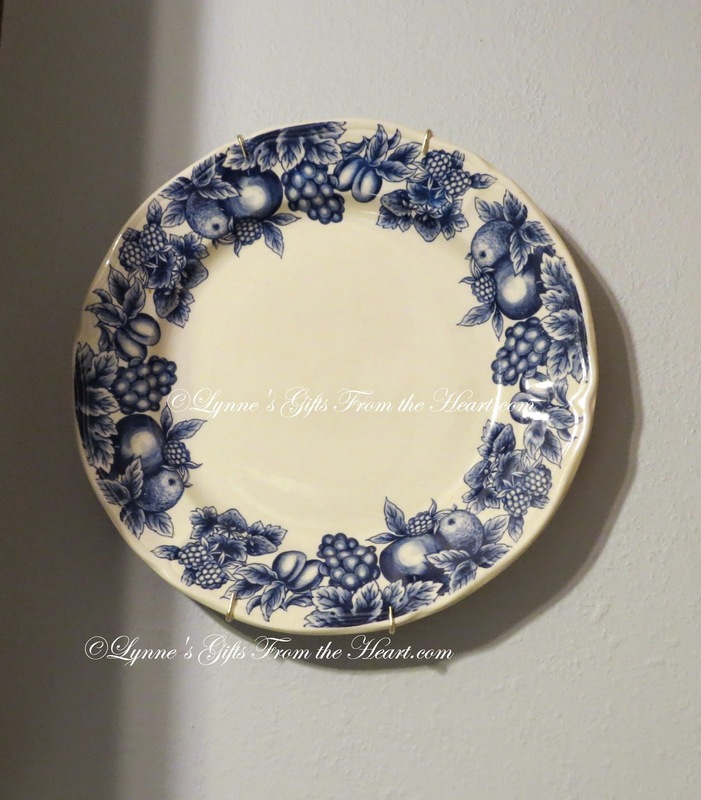 The complementary blue and white plates are elegant!!! Love the new wall color!!! 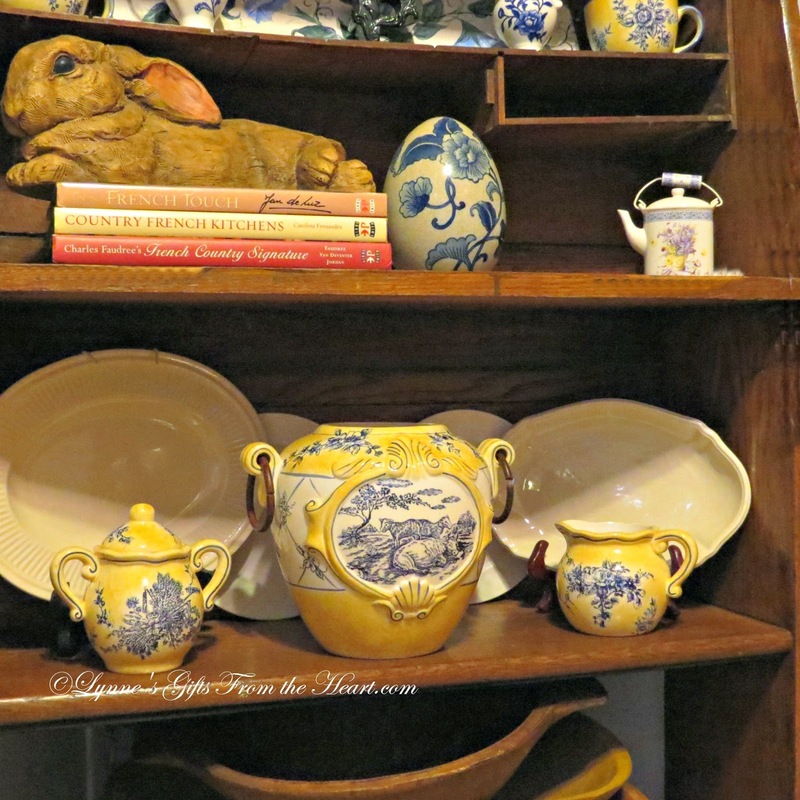 My heart is quite smitten with your bunny on the shelf! Hi darling, I'm big on rotation right now, rotate it in and rotate it out! Hope you're enjoying this fabulous weather.